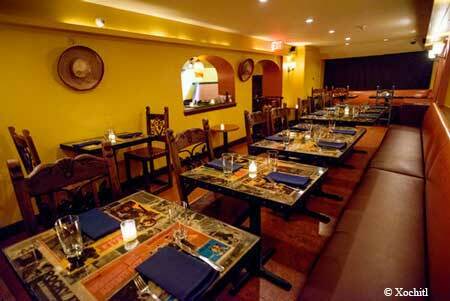 Neighborhood favorite pairs authentic Mexican fare with a lively bar scene. : If you're in the mood for Mexican food, try the tamales and other classic dishes at Xochitl (pronounced so-cheet). Margaritas and specialty tequila cocktails at this cozy establishment make a good argument for hanging about after dinner, too. (The bar stocks 75 100-percent blue agave tequilas.) The menu features traditional favorites such as queso fundido and carnitas tacos, along with signature dishes including the pollo frito --- chicken that's brined for 24 hours, dipped in a four-flour mixture, fried, and served with a sweet chile sauce, cornbread and chile cream spinach. The $28 molcajete dinner for two, offered Sunday through Thursday, is a good value: you get four different fillings for make-your-own tacos, along with a volcanic rock vessel to keep everything warm. Add in the kickin’ tableside guacamole and Xochitl stands out from the crowd.